I truly enjoy reading books by author Allison Pataki and this one was no exception. She strikes a wonderful balance between presenting historical descriptions and moving the story forward. The prose is always effortless and the story always interesting. Her depiction of Sisi is terrific. She is charismatic, vivacious, energetic, a woman who grips life and is not afraid. Slowly, Sisi evolves from a passionate woman deeply in love with her husband, to a sad young woman who feels abandoned due to the politics that pull her husband away, creating a vast distance between them. Her domineering mother-in-law is harsh, and one cannot feel bad for poor Sisi who does her best to walk a fine line between duty and personal freedoms. I enjoyed the tidbits of mystery, forbidden love, the passion Sisi had for horses and riding. I loved Franz Josef too, how he fell for Sisi, and how he over-ruled his mother to marry Sisi instead of her sister, the bride that had been chosen for him. 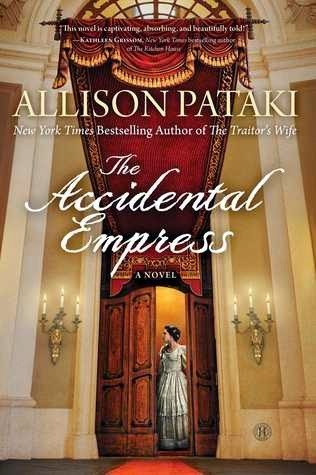 The Accidental Empress by Allison Pataki is one of the best historical fiction versions I have read about this fascinating woman's life. Beautifully rendered!